The Seattle Seahawks went into University of Phoenix Stadium and came out with a win, defeating the Arizona Cardinals 22-16. Both defenses were able to get plenty of pressure on the opposing quarterbacks through out the night, and neither team managed to run the ball well. It wasn’t an easy night for the Seattle offense, but QB Russell Wilson and company came through when it mattered, as Wilson connected with TE Jimmy Graham twice, the second time in the fourth quarter to pull well ahead. It was a far tougher night for the Cardinals offense, with both QB Drew Stanton and RB Adrian Peterson struggling to help their team move the ball. Peterson ran for only 29 yards on a whopping 21 carries, and Stanton could only muster 5.8 yards per attempt. With that, we give you our PFF exclusive takeaways from the contest for each team. Doug Baldwin made the play that separated the Seahawks from the Cardinals, as he came down with a jump ball off of a Wilson scramble which he took 54 yards to set up the second Jimmy Graham score. Outside of that play, Baldwin was a very reliable target, catching every pass thrown his way. However, he wasn’t able to create any other big plays, but he made the play that mattered to help take the Seahawks to victory. The deadline trade for Duane Brown looked to be paying off for a second game until he went down with a leg injury. Prior to his injury, he was able to get some good movement in the run game at left tackle and only gave up one pressure on 20 snaps. If Brown is able to come back healthy it would help solidify an offensive line that struggled earlier in the season. 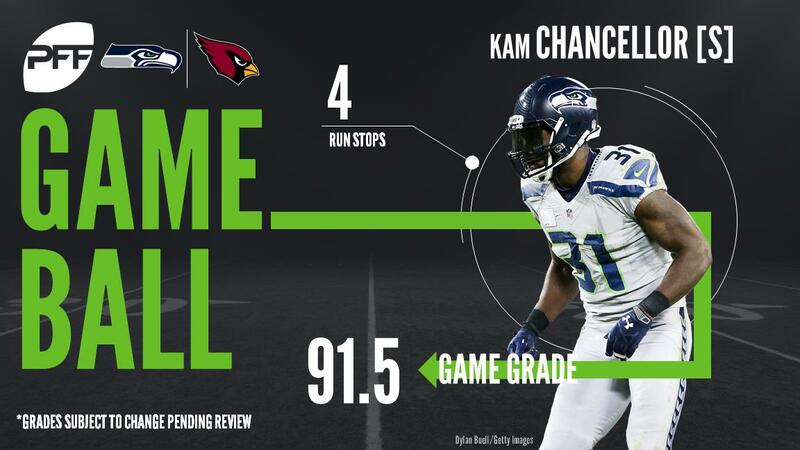 It’s difficult to make bigger impact plays than Chancellor did against the Cardinals. On the first play for Arizona’s offense, he forced a fumble against Adrian Peterson, and then followed it up with a tackle for a safety on Peterson in the second quarter. He had four defensive stops overall. While he did allow a touchdown in coverage, he also broke up another pass in the end zone. In his first game since the 2014 season, Jordan had a lot of success rushing the quarterback, even if a lot of it came against John Wetzel. On 18 pass-rush snaps, Jordan disrupted the quarterback five times with one sack, two hits, and two hurries. It will be interesting to see he if can continue to be productive as a backup and sub-package pass-rusher during the second half of the season. Fitzgerald was his typical, reliable self against the Seahawks defense. He caught nine of his 13 targets for 112 yards against seven different defenders, with 96 yards coming in the air before the catch. Of the four incomplete targets, three were broken up by Seattle defenders, giving Fitzgerald little-to-no chance of making the catch. After a big rushing week last week, Peterson did little to make a positive impact on Thursday night. He fumbled his first carry of the game, and then proceeded to gain just 34 yards on 21 total carries. While his offensive line didn’t give him much help and he had 39 yards gained after first contact, he didn’t do that much enough to create his own yardage either. As a receiver, he dropped one of his two passes, although he did force a missed tackle on Kam Chancellor to pick up a first down on his one catch. Tramon Williams was excellent on the other side of the Cardinals star CB Patrick Peterson. Williams was the most targeted defender for the Cardinals and made the Seahawks struggle when he was targeted. Williams allowed three catches on six targets for just 14 yards and was able to knock down the other three targets as he ended the day with three passes defensed. Karlos Dansby was able to turn back the clock and produce his best game of the season. Dansby recorded four stops, three in the run game and one in the pass game. When Dansby was in coverage he allowed two catches for two total yards, one of which was for a five yard loss. On top of that he was able to record two pressures on five pass-rushing snaps. Dansby showed on this day he is still a force to be reckoned with.